Earn up to 14,872 reward points. Designed with the exclusive short stroke piston feature. 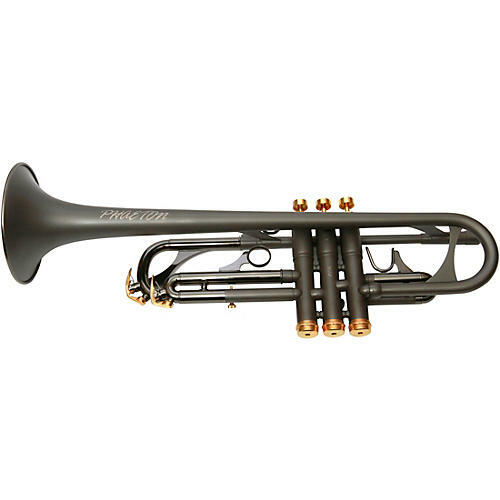 The Phaeton PHT-2045 Trumpet is one of Phaeton's custom series designed with the exclusive short stroke piston feature. Combined passion and vision were essential, as this rich sounding instrument began its journey from conception to completion. Consider its centered focused power, enhanced projection, innovative valve cluster construction and heavy weight top/bottom cap design as truly new benchmarks which have raised the bar. This model comes standard in a Matte Black Onyx finish with 18K Gold Plated finger buttons, top/bottom caps & water keys. .460” bore, Monel pistons. Fast taper reverse lead pipe and tuning slide. Get professional. Order your Phaeton today.